You are here: Home / Pumpkin Math (Count Your Pumpkins)! These puzzles are not specific for any age group. Our experience shows that all your child needs to solve the problems below is a natural curiosity, logical thinking and the ability to multiply and divide numbers! Keep the joy of discovery alive by providing hints (which you can find below) instead of explanations. 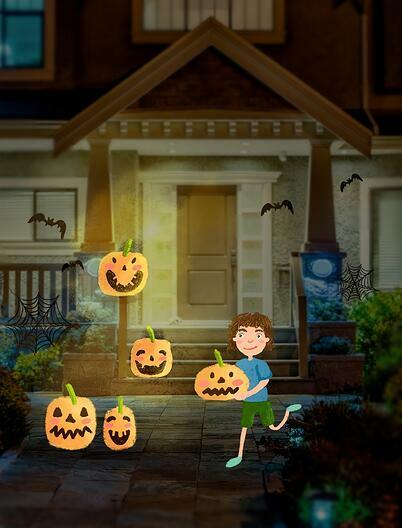 As you pass by a neighbor’s house, you notice that there is one jack-o-lantern on the porch floor, and another on the railing. Both jack-o-lanterns are lit, but what if we wish to vary which ones are lit every day based on our mood? How many days will it take until no new combination can be made? It becomes quickly clear that with two pumpkins, there can only be four different combinations: both pumpkins are lit, only the pumpkin on the porch floor is lit, only the pumpkin on the railing is lit or neither pumpkins are lit. What else can we do? What if we add more pumpkins? There are five pumpkins on the porch. How many combinations of lit and unlit pumpkins will there be? How does the number of possible combinations change by adding just one pumpkin? After adding one pumpkin, the number of lighting combinations possible doubles: All the previous combinations stay, and the new pumpkin is not lit. When the new pumpkin is lit, from every old combination you can get a whole new one by including the new pumpkin that is “on”. Answer: 8 combinations for three pumpkins, 16 combinations for four pumpkins and 32 combinations for 5 pumpkins. 2 x 2 x 2 x 2 x 2. For six pumpkins, the answer is 2 x 2 x 2 x 2 x 2 x 2 and so on. But what if we add some artistic preferences? There are five pumpkins on the porch. We want an odd number of pumpkins always lit. How many combinations will there be? Hint: If right now there are a few (not necessarily an odd number) of pumpkins lit, then we can turn them all off and then light up the rest of the pumpkins - this will give us a new combination. Solution: Let us divide every combination into pairs: If for one combination there are a few pumpkins lit, then its pair will have the rest of the pumpkins lit. Form the last puzzle, we already know the amount of combination for five pumpkins, 32. Because of this, we know that there will be 16 pairs. In every pair, there will be a one with an even number of lit up pumpkins, and one with an odd number of lit up pumpkins. So we would have a total of 16 combinations. Let’s try to solve the same question as in puzzle 2, but this time with 6 pumpkins on the porch, instead of 5. Note: It is easy to find every possible combination of lit up pumpkins (like we did in puzzle 1): If we add one more pumpkin, then the previous number of combinations would be doubled and we would get 32x2=64. Again, we can do what we did in the previous puzzle and divide every combination into complementary pairs, but here is the problem - this time either inside each pair of combinations there will be lit up an even number of pumpkins for both, or they will be an odd number. The last way to find the solution does not work, we need to find a new one! Hint: Let us light up the first five pumpkins however way we want (in any combination, not watching whether it is odd or even). We can make the sixth pumpkin “controlled”: turning it on last and only if in the first five, there is an even number of pumpkins lit up. Solution: Let us break up the combinations of lighting into 32 pairs. We have 32 combinations of lighting for the first five pumpkins. From each combination, we get two possibilities (it can either be “on”, or not) for six pumpkins. 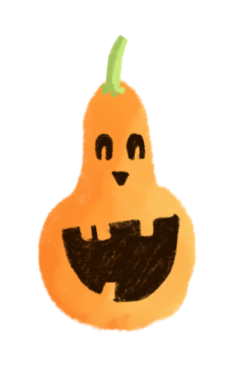 With such a division into pairs in exactly one of the two variants of the pair, an odd number of pumpkins will be “on”. Therefore, there are as many combinations as there are pairs. Here are a few challenge pumpkin puzzles if you aced all the puzzles above! How many of these days will the pumpkin on the third step burn? If you got to this puzzle and figured out the previous ones, then well done. Once you start on this “slippery slope”, you will find yourself asking more and more questions, and trying to figure out the answers! You will not need us any longer, your own curiosity will lead you. But before we part, here is one more problem as a prize for getting this far! Have fun solving it. You can do it all yourself! Nine pumpkins on the porch make a square of 3x3. How many combinations exist so that in every horizontal and in every vertical row there is an odd number of pumpkins that are “on”?